People with diabetes are more at risk of diseases of the mouth than people without diabetes. If you have diabetes, it's important to keep your blood sugar levels within target and to maintain good oral care to reduce your risk of mouth problems such as gingivitis. Common oral health problems in people with diabetes include cavities, gum disease, fungal infections, and taste impairment. High blood sugar levels can cause you to produce less saliva and have more salivary sugar, which can cause dry mouth (xerostomia). Diabetes also increases your chance of getting cavities, ulcers, and fungal infections. Additionally, people with diabetes have a lower resistance to infection and slower wound healing. Put together, people with poorly managed diabetes are more at risk of oral diseases (e.g., oral infection, gum disease). What can you do to maintain good oral health? Help prevent plaque formation and acid (from foods and drink) from attacking your teeth: Brush your teeth at least twice a day with a fluoride toothpaste and a soft toothbrush. If you can, also brush after each meal and snack. Don’t forget to floss daily. Get regular check-ups from your dentist (and let your dentist know you have diabetes!). For people with diabetes and gum disease, dentists may recommended dental visits every 3 months. Follow the schedule your dentist suggests. At the appointment, let your dentist know of any changes in your health status and any symptoms you may have (e.g., sores, mouth pain, swelling, bleeding, or areas of redness in the mouth). Don’t smoke. 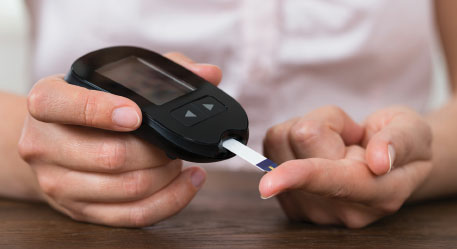 When you have diabetes, you are already at a higher risk for oral problems. Smoking and other ways of using tobacco can further contribute to gum disease. Tobacco products damage the gum tissues by cutting off their oxygen supply and making them more prone to gum infection.